The international alliance of civil society organizations CIVICUS released a report on the State of Civil Society that highlighted ten different trends in 2017. 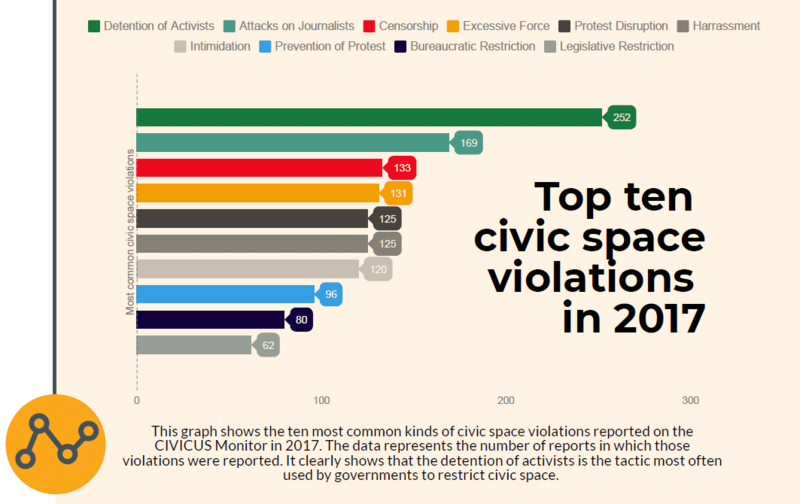 According to the report, attacks on civic space were grave, varied, and numerous, some from corners of the world where very few violations had come previously. 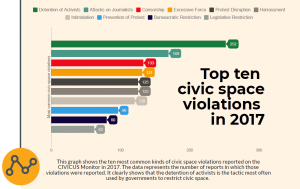 CIVICUS classified 109 countries with civic spaces either closed, repressed, or obstructed. Despite its concerning findings, the overall focus of the report maintained that, as demonstrated by concise examples of civil society’s achievements, the “fightback is on”, a new and atypical movement that seems to be continuing into 2018. The report identified trends of despotic rule, attacks on journalists, biased information, increased surveillance, and private sector overstep. Many countries struggled with corruption and maintaining checks and balances, with democratic rule being replaced by personal rule. It allowed for governments, when left unchecked, to target civil society, as well as attack independent media by quashing journalists’ efforts to unveil high-level corruption and public dissent. Furthermore, new government interference with the internet has blocked debate and discussion, as exemplified by Cameroon introducing a three-month internet block in some regions and the US ending net neutrality. Civil society especially became the mark of state surveillance online, CIVICUS writes. These efforts have also proliferated with socially conservative forces the report labels ‘uncivil society’, growing in tandem with state-sponsored dissemination of false information. Civil society is increasingly being touted by states and right-wing groups as organizations with cosmopolitan and utopian values, undermining alleged national interests. Furthermore, as support for multilateral organizations in the international area greatly diminished in a multitude of countries, led by the USA, so too did the ability of civil society to exert pressure within international bodies when states failed to cooperate on human rights issues. As a result from the lack of funding, the United Nations, as well as individual states, have turned towards the private sector for services and to stimulate business. 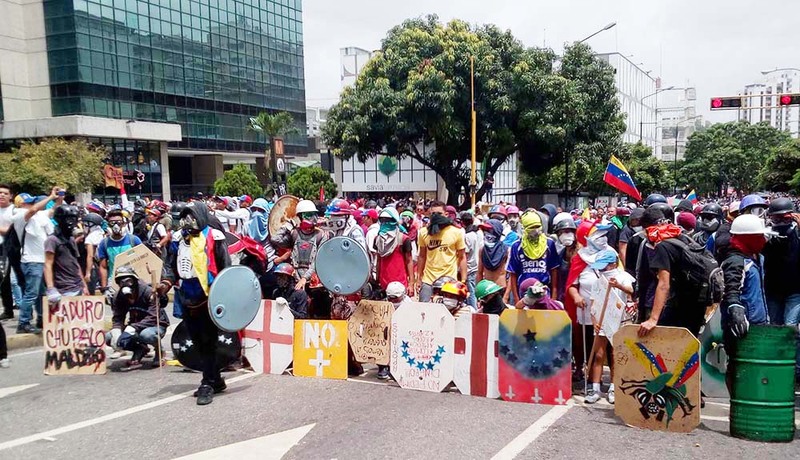 CIVICUS maintains this trend as largely an impediment to transparency and accountability for democracies, not to mention a threat to oversight by civil society in government institutions. Continuing in the economic vein, the report named globalized neoliberalism as the culprit for the heightening perpetuation of inequality throughout the world. The exportation of the Chinese model of state capitalism while refusing to acknowledge human rights, keenly followed by those who want power without oversight, has also aggravated the repression of citizens, inequality, and civic space. Decline in public spending, deregulation, and increased opportunities for corruption worsened the gap between the top and bottom concentrations of wealth and power. Disenfranchised by conventional politicking, people have sought leaders and parties who declare themselves outside of the establishment and outline straightforward solutions to complex problems. This particular trend has augmented neo-fascist, xenophobic, and border-reinforcing agendas, as evidenced in Hungary, Turkey, Russia, Uganda, and the US, all of which have dealt a heavy blow to civil society. Nonetheless, CIVICUS highlights the victories the world has seen with the #MeToo hashtag, the Time’s Up campaign, and various other forms of civil society resistance. Heightened awareness and public outcry over cases of sexual harassment have become intertwined with furthering efforts for gender equality. On corruption, a groundbreaking number of people took to the streets to protest government action in Romania and in the Dominican Republic, revealing deep-seated determination for change. Civil society organizations again rose up to provide a vital role in providing urgently needed relief for those in Mexico and the Caribbean impacted by natural disasters. El Salvador passed the first metal mining ban in the world, protecting its land from harmful environmental practice, as a result of sustained and effective pushback from civil society organizations. The newfound and strong resistance induces hope, CIVICUS states in its State of Civil Society Report, but in 2018 and beyond, civil society’s biggest struggle will be in adding more fuel to the fire in order to enhance and intensify a growing movement, even as the world’s issues continue to mount. The report will be followed by a series of dialogues and conversations on the theme of ‘reimagining democracy’ in the coming months.